The largest Democratic Party organization in the nation has called on Congress to support a 25% cut in Pentagon spending. The California Democratic Party -- which includes more than 2,000 representatives of the state's more than seven million Democrats -- adopted this policy in the past year in the face of threats by Republicans in Congress to refuse to allow the U.S. to increase its credit limit. Despite this mandate, the two most powerful Californians in Congress -- Representative Nancy Pelosi, the Minority Leader of the U.S. House of Representatives, and Senator Dianne Feinstein, Chair of the Senate Select Committee on Intelligence -- have not advocated for what their core constituents have asked that they and the other 38 Democratic members of the California Congressional delegation put on the table: a 25% cut in defense spending. Although California has a number of military installations and defense contractors, much of the money the Pentagon spends is on foreign bases and foreign wars, in Iraq and Afghanistan. The billions for the lengthy military actions in the Middle East are put on top of the Pentagon's core budget by calling this spending "Overseas Contingency Operations," which are counted as separate from regular appropriations for defense. The California Democratic Party is urging the 40 Dems in the state's 55-member congressional delegation to support cuts in the Pentagon's overall budget to "ensure that military spending prioritizes defense of the homeland and not the siting of numerous military bases on foreign soil as a substitute for robust diplomatic engagement." But this call to decrease unnecessary military spending by 25% is not yet part of the national debate on spending and debt, even as DC girds for another major showdown over spending and cuts. Meanwhile, some Republicans have renewed threats to block the raising of America's credit limit, and many of them have also demanded that the defense budget not face any significant cuts. The U.S. is poised to hit the current "debt ceiling" by mid-February. The debt ceiling is the nation's credit limit, which is set by statute, meaning that the amount of debt the U.S. can take on is set by Congress, not the president. The only other country in the world with a statutory debt ceiling akin to America's is Denmark, but its limit is reportedly set so high that the limit will likely never be met. America's debt limit was originally created by Congress in 1917 to authorize the Treasury Department to sell "Liberty Bonds" to help finance World War I. Although Treasury bonds have helped finance the wars in Iraq and Afghanistan, which were begun in the Bush administration, Republicans blocked tax increases over the past decade to help pay for the more than 1.3 trillion dollars spent on those wars alone, as calculated by the Congressional Research Service. (These are not the only costs of those wars.) The spending for Afghanistan and Iraq, on top of the Pentagon's core budget of nearly a half trillion dollars a year, has substantially contributed to the nation's debt and the need to raise the debt ceiling. Since 1960, the U.S. has raised the debt ceiling more than 60 times, but after the 2010 elections -- when the newly emerged "Tea Party" helped Republicans take over the U.S. House of Representatives -- right-wing politicians suddenly threatened to block routine measures to increase the nation's credit limit. The Tea Party rhetoric on debt echoes the long-standing claims of groups like the Koch-backed "American Legislative Exchange Council," and two more recent groups with close ties to the Tea Party, "FreedomWorks" and David Koch's "Americans for Prosperity" (AFP), both of which grew out of the oil billionaire's earlier operation called "Citizens for a Sound Economy" (CSE). With so much debt talk focused on Social Security and social programs -- and after a year of Republican presidential candidates competing over which federal agencies they would de-fund -- many Americans may not have an accurate perception of the main causes of the debt. In 2001, Republican President George W. Bush inherited a budget surplus but left office eight years later with the country deeply in debt. The Congressional Budget Office (CBO) has determined that the Bush tax cuts -- which were ended in part earlier this month in the "fiscal cliff" or "fiscal crossroads" negotiations, only after President Barack Obama won in a landslide election over Mitt Romney -- have been major drivers of the debt. The CBO also found that the lack of tax increases to pay for discretionary defense spending, including the wars in Afghanistan and Iraq is major driver of the debt. Yet Republicans have bitterly defended these policies while simultaneously blaming Obama for the debt crisis. With the economic crash, corporate CEOs have fired or laid off workers -- creating record unemployment levels -- and Wall Street banks have foreclosed on the homes of more than 15 million American families. The crash has also increased the debt due to more spending on "safety net" programs that help American families meet their basic needs and due to lower than expected tax revenues, with more people out of work or under-employed. Meanwhile, corporate profits are rising, and many Wall Street firms have bounced back to report substantial earnings. Despite the economic crunch felt by most working Americans, corporate interests have had millions of dollars to spend fighting efforts to ensure that the wealthiest people and companies pay their fair share of taxes like working Americans do -- for example fighting the "Buffett Rule" that would help ensure that a CEO's secretary does not pay more in taxes that the millionaire or billionaire heading the corporation does. It is also noteworthy that, according to the CBO, President Obama's economic stimulus package -- which was weakened by Republicans in Congress -- contributed far less to the debt than any of these other causes. Yet, Republicans are again threatening to "hold the nation hostage," in the words of Nobel prize-winning economist Paul Krugman. Even a short-term default by the U.S. on its financial obligations would, in the words of the Treasury Department, "have catastrophic economic consequences that would last for decades" and "could lead to the loss of millions of American jobs." What about Cutting Pentagon Spending? Yet such a well-precedented reduction in defense spending is not being debated, and instead some right-wingers in Congress are trying trade raising the debt ceiling for protecting the Pentagon's budget at the expense of even more devastating cuts in domestic spending. After last November's election, Koch-funded groups and their allies that buttress the Tea Party have expressly urged Congress to "blunt" cuts to the Pentagon's discretionary spending that are scheduled to occur under the Budget Control Act that Republicans forced into law in 2011 as a condition of increasing the debt ceiling that year. Under that legislation, over a trillion dollars in across-the-board spending cuts for all discretionary spending are in the works. Congress calls these cuts "budget sequestrations" because part of the money allocated by Congress in the federal budget to be spent by federal agencies would be kept away, or sequestered, from those agencies. Without raising the debt ceiling free of conditions, we cannot honor our commitments to our grandparents who need to see their doctors and purchase their meds, to our children who need trained teachers and classrooms with heat and to our neighbors who need help when jobs are scarce and earnings don't cover what life costs. Further gutting social spending will hurt those least equipped to sustain further injury. The jobless, the homeless, the young and the old will be the ones maimed. But the defense industry and the Pentagon are working hard to try to tilt public opinion. For example, the Defense Department recently issued a statement threatening to cut nearly 800,000 civilian jobs if its overall budget is subject to the sequestration provisions. Perhaps surprisingly, that method of cutting defense spending was also urged by Koch's AFP as a way to blunt cuts to the nation's war department. Lawrence Korb, who was an Assistant Secretary of Defense in the Reagan Administration and is now a Senior Fellow at the Center for American Progress, however, has called claims that Pentagon cuts would cost nearly a million jobs -- as asserted by the National Association of Manufacturers, a trade group that includes numerous defense contractors -- both "bogus" and a disreputable form of "gunpoint stimulus." Options for Targeted Cuts to Pentagon Spending v. "Gunpoint Stimulus"
In total, the U.S. has more than 700 military bases around the world, and California Democrats are asking Congress to consider specific cuts for foreign bases and also for spending on nuclear weapons. They estimate that reducing foreign bases could alone save at least $66 billion. Other common sense proposals, like drawing down the number of troops in Afghanistan and Iraq to 45,000 by 2015, would reduce defense spending by a whopping $840 billion. Reducing America's nuclear arsenal to 1050 warheads would save another $80 billion; reducing the number of ships in the Navy from 287 to 220 would save another $80 billion; and stopping the Bush Administration's "Grow the Army" initiative to increase number of active and reserve personnel would save $110 billion. Such changes would save well over $1 trillion. Even with such cuts, however, the U.S. would still have the largest military budget in the world, substantially bigger than several of the largest military budgets of other countries combined. As the California Democrats note, the U.S. military budget is "grossly out of proportion with the rest of the world in that the second highest military spending country in the world -- China -- only spends around $114 billion, and all other countries spend far less." Although defense contractor apologists like the Heritage Foundation complain that such cuts would reduce the military budget as a percentage of the "Gross Domestic Product" to "pre-World War II levels" (a talking point repeated by Romney), in real dollars such cuts would still leave the Defense Department with hundreds of millions of dollars to spend. Moreover, as the California Dems note, this is not even the total amount spent on defense related activities in the U.S. For example, the military's public budget is distinct from what is known as the "National Intelligence Program," the secret "black budget" for intelligence gathering under the Director of National Intelligence (DNI), which was budgeted at $52.6 billion for Fiscal Year 2013. The DNI's budget includes parts of the U.S. national security apparatus, such as funding for the global surveillance infrastructure of the National Security Agency and aspects of the "clandestine services." Upon leaving office in 1961, Republican President Dwight Eisenhower -- who served as the "Supreme Commander" of Allied Forces in Europe in World War II -- urged Americans to "guard against the acquisition of unwarranted influence" of the "military industrial complex." And, as the California Democrats point out, President Eisenhower recognized that, "Every gun that is made, every warship launched, every rocket fired signifies, in the final sense, a theft from those who hunger and are not fed, those who are cold and not clothed. The world in arms is not spending money alone. It is spending the sweat of laborers, the genius of its scientists, the hopes of its children." Ben Cohen, the founder of Ben & Jerry's ice cream, and others have also noted that the Pentagon's budget adds up to a lot of "cookies." Cohen's effort to put the defense budget in the context of other spending in the U.S. through his famous cookie demonstration -- available on the right -- helps illuminate the debate over debt and the choices Congress is making. The California Dems are on the record calling for the defense budget to be cut 25%, a modest cut in the grand scheme of things. But, the question remains whether their representatives and other Dems will take up this call to help the country re-calibrate its priorities to help rebuild America at home. It's about time we cut the DOD budget. All around us our infrastructer is crumbling while we're rebuilding other countrys. I do not believe for one second that God appointed us rulers of the world. With our record of bombs, agent orange and now drones I'm not surprised so many disasters are hitting our country. We've become war mongers and so darn greedy in this country that we wouldn't bend over to help an old lady up unless there was someone there to see our good deed. The money we waste in defense is enough to create alot of jobs in this country. It's time to quit pacifying the DOD and take care of Americans for a change! For a long time now, I've considered the Koch's, the tea smokers,the right wing wacko's, and the rest of their ilk Anti American bastards. Hell bent on destroying this country. There are so many factual errors in your screed it is difficult to know where to begin. But, your suggestion that anyone who disagrees with you is "socialist, Anti-American ilk infesting our great nation" underscores how futile it would try to open your eyes to the lies you have been peddled by FOX and the right-wing propaganda machine. On the judicial issue, the empirical data demonstrates quite conclusively that it is the Republican presidents who have packed the courts, both numerically and ideologically with judges who are far to the right. A review of the Almanac of the Federal Judiciary bears out that thesis. While President Reagan imposed ideological litmus tests on judges as did his successor, President Clinton repudiated the ideological pendulum and appointed primarily people whose record demonstrates that they are moderates to the court. Clinton has been criticized actually for not trying to pack the courts and for not trying to impose an ideological ounterweight to 12 years of Reagan/Reagan/Bush appointments. Despite those efforts, Republicans still blocked more than 60 of his judicial appointees, denying them an "up or down vote." When George W. Bush became president he returned to his father's playbook and put forward one of the most radically right-wing slate of judges in U.S. history. Despite this, Democrats confirmed more than 200 of President Bush's judicial nominees in their 18 months in control of the Senate. That is more judicial confirmations than Republicans allowed during the entire first term (48 months) of President Obama's administration. And, again, these nominees were more moderate than his predecessor's nominees. But, I doubt you'll let the facts get in the way of the disinformation you have been fed, although one can still hope that facts may help open a real dialogue. Nevertheless, I would urge you to please consider that your fellow Americans generally care just as much about this country as you do, cherish our Constitution and democracy just as much as you say you do, and have just as much of a right as you do to their opinions about how to make the American dream more real for themselves, their children and their grandchildren. Just because they believe in having some retirement and health security to protect them from being homeless as they age, and benefit from payments they have made into these programs their whole working lives certainly does not make them communists or anti-American. Only in an Ayn Randian dystopia could a program like Social Security, which has helped millions of Americans -- many generations of Americans, probably your parents, grandparents, and possibly great grandparents -- survive as they age out of the workplace be somehow considered anti-American. And, as for your claims of the nuclear threat faced by our Nation, the U.S. has hundreds if not thousands more nuclear warheads than any other nation on earth. To suggest it is irresponsible to call for some reduction in that armory in the face of these facts and when we have so many other pressing threats to our future is to ignore the reality of how much money is being squandered on unnecessary and wasteful defense programs to the detriment of our real national security and our economic future. I hope you will reconsider your effort to smear your neighbors based on the disinformation that the radio or TV hosts you follow have been spewing. You folks that scream out for defense cuts are complete hypocrites. Just FYI; the world is not getting safer. There are plenty of nations out there that would just love to see a nuclear weapon wipe us off the map. Before long, those countries WILL have the capabilities of using nuclear weapons. They aren't going to listen to those useless UN sanctions, and they will be able to use them against us. When that occurs, what will happen then? Folks like you will be pleading for a beef up in defense. So, I'd be careful what you ask for. 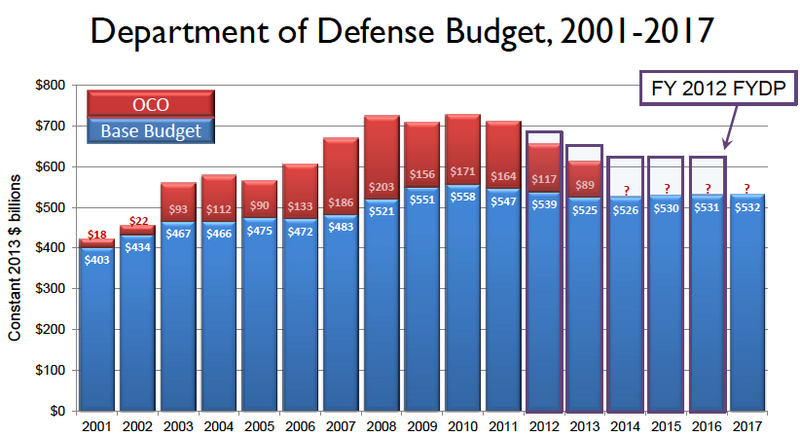 Calm down, General -- we're not so much asking for <i>defense</i> cuts as cuts in the defense <i>budget</i>. Think weapons systems even the Pentagon doesn't want, not to mention thousand-dollar toilet seats. You know, corruption, waste, fraud and abuse -- the country's real entitlement problem. Sorry, President Eisenhower, President and leader of military forces in Western Europe during WWII, was right when he warned of a "Military-Industrial Complex." Why would they try to nuke a nation that already has the 2nd largest stock pile of nuclear armerment on the planet? Even if N. Korea and Iran could obtain a nuclear war head they don't have the guidence technology that could target the U.S. Russia doesn't want a nuclear war with America so in and why would someone just decide they would risk the saftey of their own country to destroy another country. You need to calm down. WWIII isn't going to happen any time soon and we have a 15 trillion dollar national dept to pay off. We are now fighting a different kind of war. What was the costly weapons of the past are not the most efficent way to fight the wars of the future. Thank goodness for drones.